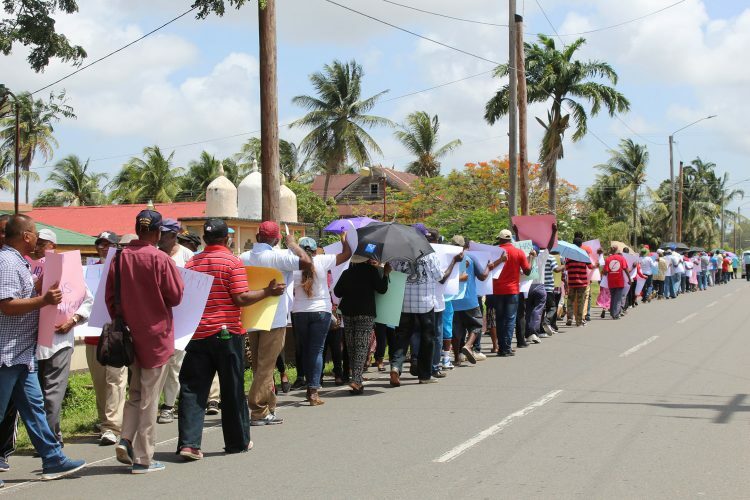 Holding firm to its belief that the APNU+AFC government became illegitimate at midnight Thursday, the PPP yesterday held picketing exercises in several regions across the country and in front of Guyana’s US and Canadian consulates. The protests were held in the morning before the Court of Appeal yesterday afternoon invalidated the passage of the December 21 no-confidence vote against the government. 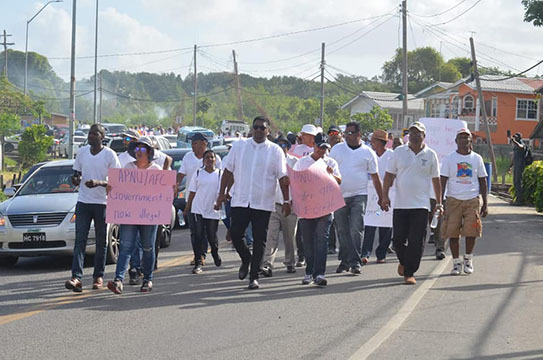 Prior to that, and at the protests, Opposition Leader Bharrat Jagdeo and other PPP officials had said that the protest actions were going to be sustained. Following yesterday’s ruling, Jagdeo said that he accepted the court’s decision but will continue working to gain ground for the party. PPP Presidential candidate Irfaan Ali, who resides at Leonora, in Region Three, led the protest in the region. “Who must go?” PPP executive member Kwame McCoy asked, as he listed parliamentary members of the APNU+AFC. 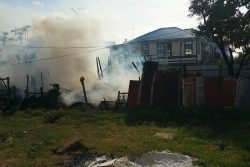 After spending about an hour in front of the Ministry of the Presidency, the group started to make their way to the Guyana Elections Commission (GECOM) office on High Street, Kingston but as they walked, several persons dropped out. In the end, a party executive informed that the GECOM protest had been cancelled. 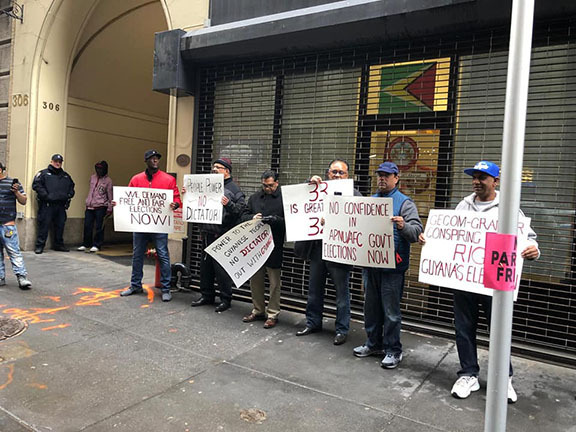 The PPP posted on its Facebook page photos of other pickets held in regions across the country and at Guyana’s New York, United States and Toronto, Canada consulates. Dubbing yesterday “A national day of mourning,” the party had asked supporters to join in planned protests here, in Trinidad, New York, Toronto, and on social media. The PPP had been calling for polls to be held by March 21st in keeping with the passage of a since disputed no-confidence motion against government last December. The deadline was based on the constitutional requirement that polls be held within three months of the passage of the motion, unless at least two-thirds of the elected members of the National Assembly agreed on an extension. The validity of the motion was challenged in court, leading to yesterday’s ruling, while GECOM has indicated that it would not be able to meet the deadline and the government and opposition failed to reach a deal on an extension. “At 12:01 am on Friday, March 22nd, let’s all set our Facebook profile photo and cover to all black. Let’s all do the same for Instagram and post a photo there that is simply black. We will then post the following as a status: “This is a dark day for Guyana. Our government is now illegal and they (are) blatantly violating the Constitution. Our jobs, investments, rights and freedom are now at risk. Ministerial and Presidential decisions and orders are now illegal. Join the protests for our democracy,” the party had stated in posts on its social media pages. 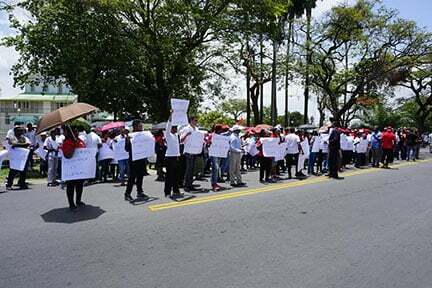 Meanwhile, several hundred Berbicians responded to the call to protest and took to the streets at various locations yesterday, calling for President David Granger to call general and regional elections immediately. “Call elections now,” was the main slogan shouted repeatedly by the protestors at the top of their voices. 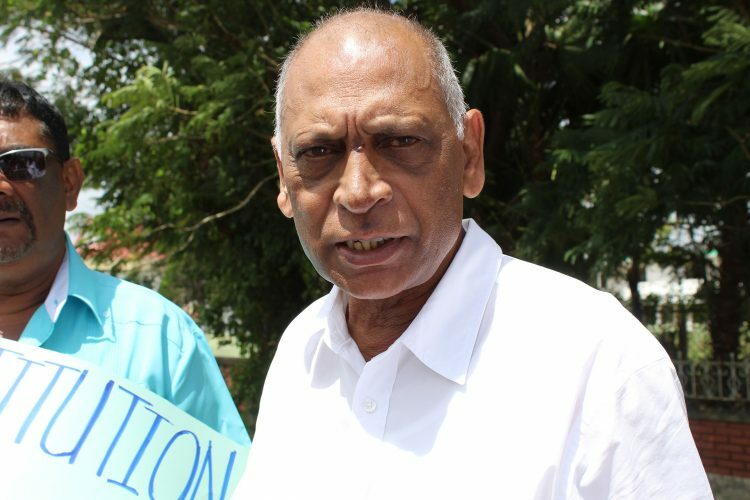 Former PPP/C minister Dr Leslie Ramsammy, who was a part of the protest in front of the GECOM office in New Amsterdam, said that yesterday’s protest was the beginning of a massive “civil resistance” in Guyana. “The PPP/C will stand by and maintain our tradition and our record of being a peaceful party but being peaceful does not mean that this now illegal government will be sitting comfortably in those seats. We will resist, and we will make it uncomfortable,” he said. According to Ramsammy, all of the government’s transgressions will be highlighted. 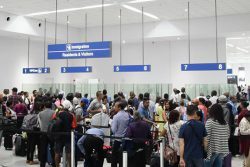 “The next paycheck that they receive for a period after March 21 is an illegal paycheck and those who write those paychecks will be transgressing the laws of Guyana and we will note them, and we will raise them every day. Every contract they sign now is illegal, every agreement they sign is illegal and we, as part of this resistance, every single day will highlight them and put them on record because we intend that any money that is illegally utilised in Guyana, every expenses that are illegal, every time they leave Georgetown now and they use a government vehicle, they are violating the laws of this country, they are utilising a government vehicle illegally, every time they go to the gas station and they spend money for their own purpose but signing a government voucher, they are breaking the law, and we intend to ensure that they are held accountable for such criminal acts,” he said. Additionally, protests were carried out in front of GECOM’s offices in Skeldon and Fort Wellington, Region Five.